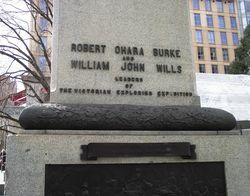 A statue commemorates explorers Robert O`Hara Burke and William John Wills, leaders of the ill-fated expedition of 1860-61. This was the first statue cast in Australia. Burke stands to the left of the seated Wills, his forearm resting on his companion’s shoulder. A book lays open book in Wills’ lap. Mounted atop granite blocks, the statue also features bronze bas-relief plaques depicting events during the expedition. It was unveiled on 21 April 1865 – the fourth anniversary of Burke and Wills’ return to Coopers Creek. On 2 November 1861, news of the death of Burke and Wills reached Melbourne, and within days grief swept the city; more than 40,000 people are said to have paid their last respects to the fallen heroes. The Victorian government announced a memorial would be erected and Charles Summers submitted the winning design. In January 1862, the Victorian government made a grant of £4000, conditional on public contributions of £2000. Like almost every other aspect of the expedition, the monument was a source of controversy. The anti-Burke faction questioned the absence of King and Gray from some of the proposed designs, and the German community threatened to boycott the fundraising because of the poor treatment of Becker, Beckler and Brahe. The government finally funded the entire cost of the monument. The monument was originally located on the corner of Collins and Russell Streets, the growth of traffic and the laying of tram tracks led to the removal of the monument in 1886. It was placed in a reserve in Spring Street, opposite Parliament House on the corners of Spring, Lonsdale and Nicholson Streets. It was moved to the corner of Swanston and Collins in City Square in 1979 and a fountain added. The statue was moved to its present location at the corner of Swanston and Collins Streets in 1994. Note : As at 10 April 2017, the monument which was within the fence-off construction site of the $10.9-billion Metro Rail project, was removed to avoid damage during the tunnelling works. It will be stored in a secret location, with $30,000 allocated for a facelift before its return to City Square once construction is complete. It is the fifth time the monument has been relocated since being erected in 1865.